Bluesound launches seven Generation 2i multi-room products | What Hi-Fi? 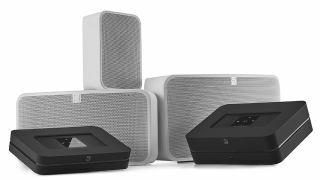 Bluesound has today launched seven new products as part of its Generation 2i multi-room family, alongside a 3.0 version of its BluOS control app. All three of its speakers – the Pulse 2i, Pulse Mini 2i and Pulse Flex 2i – have undergone varying upgrades, as have the Node 2i streamer, Powernode 2i streamer/amp, Vault 2i network streamer and CD ripper, and the Pulse Soundbar 2i. Updated features across the board include Alexa Voice Control, Apple AirPlay 2 compatibility and dual band Wi-Fi, while all but the Pulse Flex 2i – Bluesound’s smallest and cheapest wireless speaker – now benefit from two-way Bluetooth to facilitate their use with wireless headphones. While Bluesound has taken its opportunity to optimise each of its products for sound quality as well as adding new features, it is the Pulse 2i (below) that has undergone the most drastic change. In fact, pretty much everything beneath its chassis is different. The two 7cm drivers from the Pulse 2 are out in favour of 25mm tweeters, and the 13cm woofer has been revamped and twinned for a true stereo configuration that more than doubles its predecessors bass output while spreading the richness of its tone high into the upper register. The Canadian company has also upgraded its components throughout, including the Pulse 2i’s processors, in its attempt to design the ultimate hi-fi-ready multi-room speaker. Bluesound’s other wireless speakers also benefit from updated amps and a new DSP engine, though their driver configurations remain the same, while the Pulse Soundbar 2i can now be partnered with the Pulse Sub and a pair of Pulse Flex 2is to bring surround sound into the multi-room family. Interior alterations to Bluesound’s streamers have been more subtle, though trickle-down circuit design from the NAD Masters M50.2 BluOS network streamer, a smaller Wi-Fi chipset, and subsequent optimisation of layout and isolation has changed things more than their spec sheets might suggest. Other than the Pulse 2i, which takes on a £100 price increase to £749, the new Bluesound products will retail at the same prices as their Generation 2 predecessors.